The Great Hall of the People in Beijing. “Deliberately distorting the lyrics or music” of the national anthem could yield extended time behind bars. 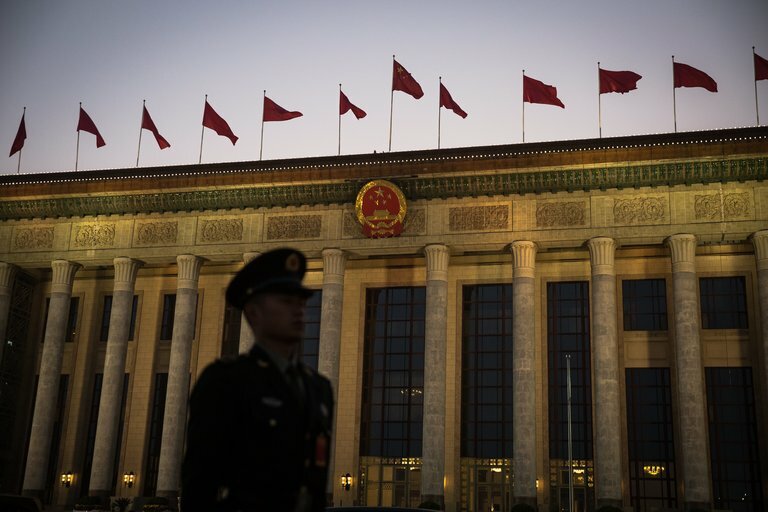 BEIJING — A mere month after China put in force a law threatening up to 15 days of detention for disrespecting its national anthem, lawmakers have decided that the punishment was far from enough — by almost three years. Members of China’s Communist Party-controlled legislature, the National People’s Congress, on Saturday approved an amendment to another law that could mean prison terms of up three years for people who gravely insult the anthem in public. Offenders could face imprisonment for “deliberately distorting the lyrics or music of the national anthem of the People’s Republic of China, singing the national anthem in a distorted or derogatory fashion, or insulting the national anthem in other ways,” said the amendment to the criminal law, which already set punishments for insulting the national flag and emblem. The lawmakers took the step even though there seem to be few, if any, cases of people protesting in China by reworking the national anthem. But the move reflects the deepening demands for patriotic devotion that have been encouraged by Xi Jinping, the president and party leader who has made the “Chinese Dream” his signature political theme. In Hong Kong, the former British colony, the latest efforts to instill reverence for the anthem may be met with vigorous protest.